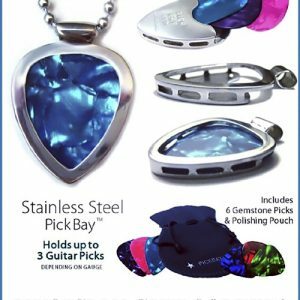 Two (2) Classic Stainless Steel PICKBAY guitar pick holder pendant sets with leather cord necklaces! The ULTIMATE set of 2 PICKBAYs! Most popular gift set for him AND for her! 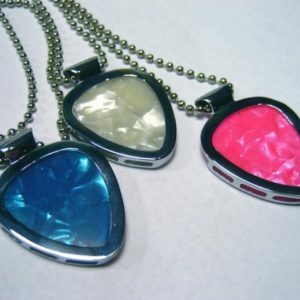 Guys like it ’cause it’s got a blue Fender pick. 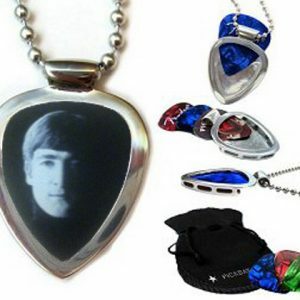 Flip the pick over and ladies like it ’cause it looks like that Titanic movie necklace. THIS IS FOR two (2) PICKBAY sets. It’s a unisex item. 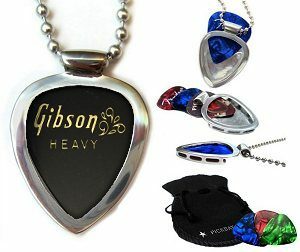 Plus 2 leather cord necklaces AND hypoallergenic shiny aluminum necklaces included too, plus guitar pick a bag of additional celluloid guitar picks (ruby, sapphire, emerald + more colors) velvet polishing pouch Fabulous gift set they will love forever!